This blog is a photographers journey through the lens. Last night I arrived at the beach, a little tired and having to clean up a bit after a couple rentals before settling in....but not too bad. Today after several cups of coffee and some breakfast I turned on the computer and Barbara Kile had left a comment on a post I made about choices. She has made some herself lately and also made a parallel post on her blog recently regarding choices in photography. She is a tremendous photographer and Facebook friend. After looking at some of her work I decided to go to the Alien Skin site and download a trial version of Snapart2. I first saw Tony Sweet, (he is first at everything I swear!) use this software program and enjoyed the "Look" he achieved but wasn't quite ready to try it for some reason. But today, I had some time.....and just processed this image with the Snapart2 program, which has lots of options for processing your images. 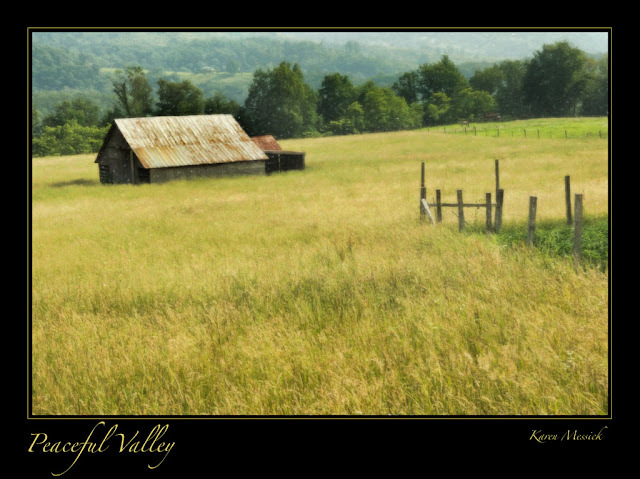 The shot is a wider angle view of Bonnie Nelson's farm in Dry Fork, West Virginia, which I had previously posted in a different composition. This image was first processed as an HDR in Photomatix, then worked in PS and Topaz, and now Alienskin Snapart2; whew thats a lot of processing stuff. I think it lends itself to this subtle yet artistic rendition. I like this image and the ones above from the beach walk. Barbara got me interested in and involved with photography last year. I've known her and her husband since our undergrad days at TCU when they were dating. Anyway, I saw her use some Snapart in her floral images and wasn't taken with the painterly look at that time. Then I see some others use some Snapart and decided to give it a trial run. Well... I liked it and how you could lower the opacity to use just a touch of the art like look or use it full strength. I got it and haven't looked back. Snapart just adds an extra dimension to some images. Very nice. Just click on the image above use the discount code KarenM and save on your purchase! image evolution, breakin the rules and what if's? Thank Goodness the Mac keeps track of the days!